February 29, 2016 – The return of supersonic passenger air travel is one step closer to reality with NASA's award of a contract for the preliminary design of a “low boom” flight demonstration aircraft. This is the first in a series of ‘X-planes’ in NASA's New Aviation Horizons initiative, introduced in the agency’s Fiscal Year 2017 budget. “NASA is working hard to make flight greener, safer and quieter – all while developing aircraft that travel faster, and building an aviation system that operates more efficiently,” said Bolden. “To that end, it’s worth noting that it's been almost 70 years since Chuck Yeager broke the sound barrier in the Bell X-1 as part of our predecessor agency's high speed research. Now we’re continuing that supersonic X-plane legacy with this preliminary design award for a quieter supersonic jet with an aim toward passenger flight." 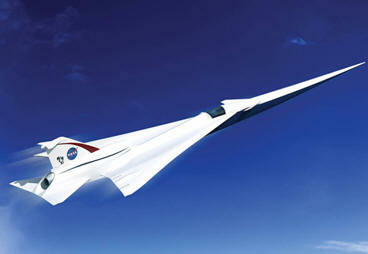 After conducting feasibility studies and working to better understand acceptable sound levels across the country, NASA's Commercial Supersonic Technology Project asked industry teams to submit design concepts for a piloted test aircraft that can fly at supersonic speeds, creating a supersonic "heartbeat" a soft thump rather than the disruptive boom currently associated with supersonic flight. “Developing, building and flight testing a quiet supersonic X-plane is the next logical step in our path to enabling the industry's decision to open supersonic travel for the flying public," said Jaiwon Shin, associate administrator for NASA’s Aeronautics Research Mission. Lockheed Martin will receive about $20 million over 17 months for QueSST preliminary design work. The Lockheed Martin team includes subcontractors GE Aviation of Cincinnati and Tri Models Inc. of Huntington Beach, California. NASA’s 10-year New Aviation Horizons initiative has the ambitious goals of reducing fuel use, emissions and noise through innovations in aircraft design that departs from the conventional tube-and-wing aircraft shape. The New Aviation Horizons X-planes will typically be about half-scale of a production aircraft and likely are to be piloted. Design-and-build will take several years with aircraft starting their flight campaign around 2020, depending on funding.